For other uses, see King (disambiguation). In a modern context, the title may refer to the ruler of one of a number of modern monarchies (either absolute or constitutional). The title of king is used alongside other titles for monarchs: in the West, prince, emperor, archduke, duke or grand duke, and in the Middle East, sultan or emir, etc. 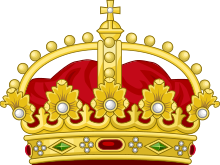 The term king may also refer to a king consort, a title that is sometimes given to the husband of a ruling queen, but the title of prince consort is sometimes granted instead. A king dowager is the male equivalent of the queen dowager. A king father is a king dowager who is also the father of the reigning sovereign. Look up cyning in Wiktionary, the free dictionary. The English term king is derived from the Anglo-Saxon cyning, which in turn is derived from the Common Germanic *kuningaz. The Common Germanic term was borrowed into Estonian and Finnish at an early time, surviving in these languages as kuningas. The English term "King" translates, and is considered equivalent to, Latin rēx and its equivalents in the various European languages. The Germanic term is notably different from the word for "King" in other Indo-European languages (*rēks "ruler"; Latin rēx, Sanskrit rājan and Irish ríg, but see Gothic reiks and, e.g., modern German Reich and modern Dutch rijk). It is a derivation from the term *kunjom "kin" (Old English cynn) by the -inga- suffix. The literal meaning is that of a "scion of the [noble] kin", or perhaps "son or descendant of one of noble birth" (OED). The English word is of Germanic origin, and historically refers to Germanic kingship, in the pre-Christian period a type of tribal kingship. 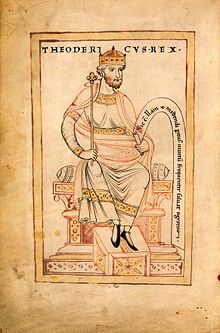 The monarchies of Europe in the Christian Middle Ages derived their claim from Christianisation and the divine right of kings, partly influenced by the notion of sacral kingship inherited from Germanic antiquity. The Early Middle Ages begin with a fragmentation of the former Western Roman Empire into barbarian kingdoms. In Western Europe, the kingdom of the Franks developed into the Carolingian Empire by the 8th century, and the kingdoms of Anglo-Saxon England were unified into the kingdom of England by the 10th century. With the breakup of the Carolingian Empire in the 9th century, the system of feudalism places kings at the head of a pyramid of relationships between liege lords and vassals, dependent on the regional rule of barons, and the intermediate positions of counts (or earls) and dukes. The core of European feudal manorialism in the High Middle Ages were the territories of the former Carolingian Empire, i.e. the kingdom of France and the Holy Roman Empire (centered on the nominal kingdoms of Germany and Italy). In the course of the European Middle Ages, the European kingdoms underwent a general trend of centralisation of power, so that by the Late Middle Ages there were a number of large and powerful kingdoms in Europe, which would develop into the great powers of Europe in the Early Modern period. In the Iberian Peninsula, the remnants of the Visigothic Kingdom, the petty kingdoms of Asturias and Pamplona, expanded into the kingdom of Portugal, the Crown of Castile and the Crown of Aragon with the ongoing Reconquista. In southern Europe, the kingdom of Sicily was established following the Norman conquest of southern Italy. The Kingdom of Sardinia was claimed as a separate title held by the Crown of Aragon in 1324. In the Balkans, the Kingdom of Serbia was established in 1217. In eastern-central Europe, the Kingdom of Hungary was established in AD 1000 following the Christianisation of the Magyars. The kingdoms of Poland and Bohemia were established within the Holy Roman Empire in 1025 and 1198, respectively. In Eastern Europe, the Kievan Rus' consolidated into the Grand Duchy of Moscow, which did not technically claim the status of kingdom until the early modern Tsardom of Russia. In northern Europe, the tribal kingdoms of the Viking Age by the 11th century expanded into the North Sea Empire under Cnut the Great, king of Denmark, England and Norway. The Christianization of Scandinavia resulted in "consolidated" kingdoms of Sweden and Norway, and by the end of the medieval period the pan-Scandinavian Kalmar Union. Currently (as of 2016[update]), fifteen kings are recognized as the heads of state of sovereign states (i.e. English king is used as official translation of the respective native titles held by the monarchs). Most of these are heads of state of constitutional monarchies; kings ruling over absolute monarchies are the King of Saudi Arabia, the King of Bahrain and the King of Eswatini. Harald V King of Norway Glücksburg konge Kingdom of Norway 11th c.
Carl XVI Gustaf King of Sweden Bernadotte konung Kingdom of Sweden 12th c.
^ There have been rare exceptions, most notably Jadwiga of Poland and Mary, Queen of Hungary, who were crowned as King of Poland and King of Hungary respectively during the 1380s. 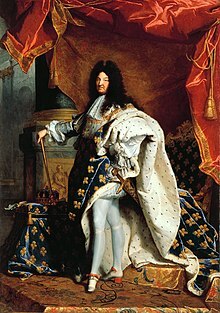 ^ The notion of a king being below an emperor in the feudal order, just as a duke is the rank below a king, is more theoretical than historical. The only kingdom title held within the Holy Roman Empire was the Kingdom of Bohemia, with the Kingdoms of Germany, Italy and Burgundy/Arles being nominal realms. The titles of King of the Germans and King of the Romans were non-landed titles held by the Emperor-elect (sometimes during the lifetime of the previous Emperor, sometimes not), although there were anti-Kings at various points; Arles and Italy were either held directly by the Emperor or not at all. The Austrian and Austro-Hungarian Empires technically contained various Kingdoms (Hungary, Bohemia, Dalmatia, Illyria, Lombardy–Venetia and Galicia and Lodomeria, as well as the Kingdoms of Croatia and Slavonia which were themselves subordinate titles to the Hungarian Kingdom and which were merged as Croatia-Slavonia in 1868), but the Emperor and the King were the same person. The Russian Empire did not include any kingdoms. The short-lived First French Empire (1804–1814/5) did include a number of client kingdoms under Napoleon I, such as the Kingdom of Italy, the Kingdom of Westphalia, the Kingdom of Etruria, the Kingdom of Württemberg, the Kingdom of Bavaria, the Kingdom of Saxony and the Kingdom of Holland. The German Empire (1871-1918) included the Kingdoms of Prussia, Bavaria, Württemberg and Saxony, with the Prussian King also holding the Imperial title. ^ see e.g. M. Mitterauer, Why Europe? : The Medieval Origins of Its Special Path, University of Chicago Press (2010), p. 28. ^ The distinction of the title of "king" from "sultan" or "emir" in oriental monarchies is largely stylistics; the Sultanate of Oman, the State of Qatar, the State of Kuwait and the United Arab Emirates are also categorised as absolute monarchies. Thomas J. Craughwell, 5,000 Years of Royalty: Kings, Queens, Princes, Emperors & Tsars (2009). David Cannadine, Simon Price (eds. ), Rituals of Royalty: Power and Ceremonial in Traditional Societies (1992). Jean Hani, Sacred Royalty: From the Pharaoh to the Most Christian King (2011). Phillip, Walter Alison (1911). "King" . Encyclopædia Britannica. 15 (11th ed.). pp. 805–806.